You are about to learn . . .
Urula HA-DS is the all-natural anti-aging food supplement from Japan. Containing Hyaluronic Acid (HA). It's the latest weapon in the war on aging. While slowing down our aging process, Urula HA-DS is proven effective as a beauty and skin care ingredient. It's "Revolutionary" since it revitalizes the skin from inside out, reaches the entire body. 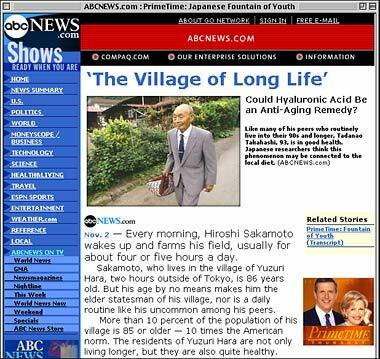 Year 2000, ABC News team went to Japan, reported from the village of Yuzuri Hara, two hours outside of Tokyo. Yuzuri Hara is known in Japan as the "Village of Long Life", residents there routinely live into their 90s and longer. Japanese scientists believe this phenomenon may be connected to the local diet. Based on this theory, after years of research by Japanese scientists, an all-natural anti-aging food supplement Urula HA-DS was developed. This development is a major health science breakthrough in a nation with 22% population age 65 and older. And it's certainly news worthy for the rest of the world.